In 2018, our work on human resources has firmly adhered to the Company’s overall strategies in transformation and upgrades. We further liberalised our thoughts, innovated mechanisms, solidified foundation, standardised management and optimised the allocation of existing resources in order to continuously enhance human resources efficiency and provide sound organisational assurance and personnel support for the corporate’s sustainable and healthy development. We continue to promote younger cadre team and optimise the leadership structure of our provincial and municipal branches. Through methods including selection and recruitment, job exchange programme and rotation, as well as succession and retirement, we optimised our executive teams among headquarters, provincial branches and professional units. A group of well-recognised executives with superb qualities, distinguished capabilities and outstanding performance were selected and promoted to important management positions, hence the professional and age structure of our management teams became more reasonable and balanced. We increased our efforts in training excellent young cadres and development of excellent young cadres training management system, and established database of excellent young cadres talents with unified management, hierarchical implementation and dynamic adjustment, so as to provide organisational assurance for the corporate’s sustainable and healthy development. We established specialised cadres supervisory organisation to strengthen the supervision on staff selection and appointment. We embedded staff selection and appointment inspections into internal review, and continuously carried out special inspections, specific governance, and rectification according to categories so as to ensure specific governance work attaining effective results. By continually deepened rectification, the Company further standardised the work on staff selection and appointment, improved the quality of staff selection and appointment, enhanced the creditability on staff selection and appointment and created better employment environment. In 2018, the Company updated and published the Measures of China Telecom on High-Level Professional Talent Management Service and further defined work planning and development goals of “Hundred, Thousand and Ten Thousand Professional Talent Project”. We improved mechanism on the talents selection and inducing, use and evaluation, nurturing and development, merit-based and dynamic management and talents services. The cloud computing branch of the Company established a pilot “Talent Zone” programme, while promoting a more proactive, open and effective talent policy. The Company further optimised system of professional workstations, broke the units, department and geographical boundaries and enhanced co-sharing of talents. With the combination of MSS centralised human resources system, we solidified talents data foundation and carried forward the work focusing on the enterprise’s key tasks in transformation and upgrades. In 2018, the Company optimised and perfected the function of centralised human resources system, established the master data of human resources management platform, realised convergence of key business data. The Big Data analysis of human resources supported the establishment of resources allocation and talent teams which promoted intelligent management of human resources. The Company continued to promote intelligent human resources management projects, strengthened system modeling and analysis and application of intelligentised business and enhanced precision management level of human resources, which facilitated corporate scientific decision-making. We endeavour to maintain close connection with the employees, understand the employees in all aspects and do our best in relation to employee ideological work. The Company organised employee representatives to put forward proposals. The proportions of the classification of the proposals are 20% business development, 16% employee welfare, 13% business products, 11% labour, 10% talent team construction, 10% network construction and maintenance and 7% core business synergy. Cadres of labour unions at all levels, employees’ representatives and heads of labour unions insisted on in-depth investigations of frontline employees’ conditions. Through attending employees forum, conducting questionnaire surveys and visits, having face-to-face communication with staff, handling the letters or emails, as well as through the channels of chairman mail box, staff forum, YiChat and WeChat account. We investigated and understood the staff’s situation for 54,700 times. We pushed forward handling of requests from employees proactively and resolved 12,500 requests. We dedicatedly carry out job innovation activities around stimulation of vitality of employees, enhancement of capabilities and strengthening execution capability to motivate employees to love and respect their jobs and to make contributions. The Company launched activity for nominating innovative and excellent working team and individual. Approximately 4,000 outstanding teams and individuals shared and presented on the “Dual Hundred” platform, among which 99 innovative teams and 99 outstanding individuals were recognised. Labour unions of the Company organised “May 1st” recognition seminar. The Company received a total of 254 external honours on comprehensive and specific categories at national, provincial and ministerial levels, including 14 national honours, 240 provincial and ministerial honours, 101 group honours and 153 individual honours while the number of honours within each category reaches a historical high. 48 units of pioneer group of China Telecom and 149 outstanding workers were recognised. 1 grassroots unit was awarded the title of pioneer group of china national defense posts and telecommunications industry, 1 junior staff was awarded the title of outstanding workshop manager, 1 vice chairman of labour unions at provincial level was awarded the title of the most dependable colleague and 6 employees were awarded the title of craftsman in telecommunications industry. Surrounding the key tasks of business development, the Company’s unions and business department organised 6 skills competitions and 6 labour competitions. 18 technical masters of state-owned enterprises (B2 grade), 116 company technical/labour masters (C2 grade) and 847 company technical/labour pacesetters (C3 grade) were selected through the competitions. We organised real-practice competitions and selection contests such as concurrent enhancement on the quality of mobile and fibre networks, IT skills, maintenance skills at company level and cloud base facilities which earned a good reputation among the employees. All levels of enterprises and unions carried out more than 3,700 labour competitions, held “My job, my innovation” series activities, and organised over 2,500 activities such as job innovation contest, case sharing and micro-innovation activities resulting in more than 19,000 job innovation achievements and where they have been imitated by others for more than 5,500 times. The Company established 1,246 innovation workshops named after innovative and outstanding employees. The Company included the establishment of “Four-Smalls” into the key work evaluation. The Company’s labour unions evaluated the establishment of “Four-Smalls” on a quarterly basis. Responding to everyday demands of our employees, enterprises at all levels newly built 2,203 “Four-Smalls” facilities, consolidated and enhanced 7,353 established “Four-Smalls”, and invested over RMB237 million. We selected and set over 1,100 “Four-Smalls” benchmarks. The “Four-Smalls” established by northern counties’ branches increased to 82% from 31%. Standardised and regulated construction of “Four-Smalls” was promoted by the Anhui and Tibet branches and the comprehensive improvement on the environment of the counties’ branches was promoted by branches in Hunan, Guizhou and Jiangsu which enriched the connotation of “Four-Smalls” brand. Labour unions at all levels actively responded to employee’s needs, and helped with over 14,000 tasks for employees cumulatively, and installed more than 1,600 air purifiers in offices and almost 6,000 water purifiers for grassroots. We expanded the channels and contents for employees’ services, organised more than 2,700 health seminar and EAP pressure relief activities. The labour unions provided medical services to more than 47,000 individuals and travel convenience for over 60,000 employees. We organised more than 7,000 group buying activities for employees and improved the accommodation conditions for over 9,000 employees. Labour unions at all levels assisted 18,900 employees who were in hardship. 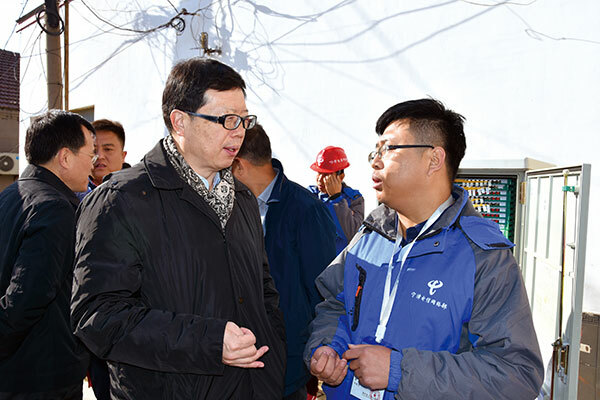 During New Year and Lunar New Year holidays, which were critical periods for operations and production, all levels of management visited frontline employees to show their care for employees. The Company expressed sympathy and care to more than 60,000 frontline employees who insisted on staying on duty during national holidays. We timely visited employees from 12 provinces affected by disasters. Labour unions at all levels congratulated employees who had newborns, whose children were admitted to schools and universities and whose children were enlisted, expressed their sympathy when the employees suffer from sickness and death of their family members. Over 1,500 knowledge exchange activities among outstanding workers were held by all level of labour unions. The “Scholar Family” reading activities were held by the labour unions for four consecutive years and the selection activities of 100 “Elite Female” store managers and excellent channel managers had been held by the labour unions for five consecutive years. Provincial branches in Anhui and Guangdong arranged 2,221 outstanding female representatives and female workers to subscribe for the HPV vaccine injection project organised by Women Workers’ Department of All-China Federation of Trade Union. We built over 1,000 Mommy Cabins, purchased over 3,000 radiation protection suits for female employees during pregnancy, organised over 700 female-worker themed seminars and carried out approximately 3,000 activities for female employees on Women’s Day. The labour unions organised the “e-Surfing Cup” employee table tennis match. We organised participation in various activities which was organised by Communication Sports Association, and got excellent results in matches such as national bridge game tournament, national representative employees table tennis and football matches and table tennis and volleyball matches in telecommunications industry. Employees in China Telecom gave brilliant performances. Labour unions at all levels carried out cumulatively 37,000 various activities with the participation rate of employees reaching 88%. Recreational and sports activities went deep into the frontlines which enriched the cultural life of employees and strengthened their team spirit. China Telecom actively undertook and participated in the national professional knowledge update projects for professional and technical personnel. In October 2018, we held the knowledge update project seminar of the Ministry of Human Resources and Social Sciences at China Telecom College — “Advanced Training Class on Key Technology in Supply Chain of Internet of Things”. Professional technicians or managers in advanced professional and technical positions from 72 units, such as Internet of Things, information technology management and intelligent product innovation attended the seminar. We actively promoted the construction of national-level professional and technical personnel continuing education base. In 2018, the training centre in China Telecom Zhejiang branch was used as a national-level professional and personnel continuing education base. We updated the knowledge for national-level professional and technical personnel, expanded their knowledge structure and improved the comprehensive quality and innovation capabilities of the participants. Focusing on the four areas of “Information, Equipment Manufacturing, Financial Accounting and Social Works”, we implemented training programme for training and cultivation of talents that are in urgent demand and job training programme with trainees almost reaching 10,000 people. We endeavoured to become the service platform for cultivating high-level, urgently-needed and backbone professional and technical personnel for the nation. In 2018, China Telecom Online College focused on the Company’s annual training key areas. We promoted the open sharing of products, data and capabilities by creating an open platform, continually strengthened the resources building and operation by constructing quality resources and carrying out theme resources marketing activities and effectively enhanced the application level in aspects of centralised management training of the Company, intellectualisation of talent development and intelligentisation of employee learning. In 2018, China Telecom Online College had cumulatively supported 36,514 face-to-face training classes. With 148,828 people using the Online College to study, we had added 4,705 online learning resources, held 181 skills certification and professional examinations for 32 job units, organised and held 530 online training classes. Focusing on key business areas, China Telecom Online College organised study activities such as knowledge contest and case collection for positions such as “Unit CEO”. Focusing on the government-enterprise line, the Online College organised the 59th political enterprise business learning courses, further enhancing business development in key areas. In 2018, China Telecom held the score based evaluation and star-grade recognition on the special recruitment, recruitment and trial recruitment of the internal trainers of the Company. Two internal trainer teams at the group-level relating to enterprise information and cloud computing were added. By December 2018, there were a total of 10,799 internal trainers at all levels in China Telecom, of which the company-level internal trainers reached 885 people. Following 5 steps of recruitment, selection, cultivation, utilisation and evaluation, and leveraging the internal trainers management IT system, we built the internal trainers team and implemented the tiered management training mode. In 2018, in the aspect of cultivating professional and leading talents in advanced high-level transformation, we commenced “Spark Programme” for the transformation of cultivating professional and high-level talents in three professional fields including Big Data, 5G and cloud computing through cooperating with top research and development institutions, laboratories and enterprises. In the aspect of cultivating high-level professional talents, the Company held 23 professional talents training courses at a corporate level with 630 trainees. In the aspect of capabilities enhancement of professional and technical talents, the Company proactively organised various training courses and talent training camps. Through society recognition, industry recognition, company recognition and various other methods, the perfect and highly skilled talents assessment system which met the requirements of the characteristics of telecommunications industry and enterprise talent current status was established. We organised a new session of “Unit CEO” Capacity Improvement and Cultivation for the period of 3 years (2018-2020). The number of “Unit CEO” training courses at the corporate level broke through 100 during this year for the first time with 4,685 participants, which was 43% more than that in 2017. We organised 26 training courses such as courses development, training sessions with top professors and training sessions for core employees, providing courses, teachers, operational standards and case studies in all aspects for provincial and municipal branches. We organised joint training for six major areas nationwide, with total of 74 training courses, which successfully promoted the sharing of training resources and cross-regional experience. Good news arose from each professional lines, real-life training. The first was the government-enterprise professional line. On 9 May 2018, the “Value-Creation Marketing” of China Telecom’s government-enterprise professionals were awarded “2017 ATD excellence in Practice Award“. The second was the “store manager training”of the distribution channel line, it was awarded “2018 the Best Practical Award” by the China International Society of Performance Improvement. The third was the “e-Surfing crossing together” activity for promoting experience of transformation and practical benchmark organised by the marketing department with various departments, which effectively promoted seizing opportunities in different areas, accelerated development and transformation while the way of delivering training to grassroots was widely welcomed. The fourth was the network operation and IT operation focused on the emerging area “Cloud Network Integration” with talent cultivation project and construction of real training base, while the development of cloud business and cloud changing project had made new exploration and breakthrough. We continuously promoted regularised operation management of the internship programme. Leveraging our internship platform, we organised spring internship, summer internship, day-to-day internship and other activities to expand the channels to induce brilliant young talents for campus recruitment. We also continued to organise top graduate cultivation programme, while over 1,300 top graduates for this programme were selected by units at all levels. The Company organised 3 sessions of corporate-level outstanding graduate demonstration class, which drove the Company to strengthen the training of outstanding young employees. The Company recruits fresh university graduates and mature talents from the society. The Company organised unified platform, unified advertising and unified key universities promotions and talks to recruit fresh graduates. Throughout the year, the Company recruited more than 7,000 new graduates. The Company promoted the realisation of full coverage of the pilot programme for new employee tutoring projects within the Company, and formulated the Administrative Measures of China Telecom Pilot Programme for New Employee Tutoring Projects to guide units at all levels to carry out the work of pilot programme for new employee tutoring projects. For the recruitment of mature talents from the society, the units at all levels orderly organised recruitment in accordance with business development needs. To provide opportunities for the employees’ career development, the Company developed a comprehensive dual promotion channel. Promotion is based on the principles of fairness, justice, openness and transparency. The Company fully respects employees’ rights of choice, knowledge and scrutiny. In the recruitment and promotion processes, the Company treats all candidates and employees equally regardless of gender, age and race. The Company strictly abides by the national regulations relating to employees’ working hours and implemented the Regulations on Paid Annual Leave for Employees promulgated by the State Council and formulated the relevant policies in relation to employee vacation. The Company strictly abides by the laws and regulations such as the Labour Law of the People’s Republic of China and the Labour Contract Law of the People’s Republic of China to regulate its employment practices. The Company adheres to offering equality of remuneration and work for male and female employees and implements special regulations to protect female employees’ rights and interests. There were no discriminatory policies or regulations, nor had there been any circumstance whereby child labour or forced labour was employed. The Company strictly abides by relevant regulations of the labour contract law and constantly improved the relevant employee management systems. Taking into account the actual circumstances of the Company, we established relevant system and developed detailed provisions for termination of employee labour contracts. The Company implemented the differentiated remuneration distribution system under which positions are used as the foundation, a close and direct linkage between performance and contribution is established and which is applicable to characteristics of different positions. The system is mainly comprised of post salary, performance salary, allowance and subsidies, insurance benefits, etc.. Meanwhile, all units are encouraged to actively explore remuneration distribution methods that meet different positions’ characteristics according to business development requirements, including annual salary system, commission fee system, project wage system and piece-rate wage system. We adhere to being performance-oriented and fair in internal distribution and tilt towards high-quality professionals and frontline staff so as to encourage more pay for more work. Persisting in the optimisation and perfection of labour costs resources allocation, as well as the close linkage between corporate development and performance contribution, we implemented different resources allocation model for various units integrating with its own characteristics, and fully mobilised the enthusiasm and initiatives of development of various units, encouraging everyone to adhere to “high contribution, high yield” and “early development, early benefit”. The Company has established a relatively comprehensive performance evaluation system for all of its employees. Branches at all levels have established employees’ performance evaluation teams which are led by the respective general managers of the relevant branches and have formulated evaluation methods for deputies, functional departments, subordinated units and general employees. The Company improves its employee evaluation and incentive mechanism and the related scrutiny and supervision system to ensure fair and reliable performance evaluation results. At the same time, we further optimise and improve the performance evaluation system and implement performance evaluation by categories of business units, deputies, mid-level management and employees of all levels, enhancing the specificity of the performance evaluation.